The other night I took a pan of cookies out of the oven and did the unthinkable: I dropped it on the floor, upside down. This was annoying for a couple reasons. First, I had a big-time craving for chocolate chip cookies and now I had to wait 12 more minutes (gasp!) until I could bite into some ooey-gooey goodness. Second, and more importantly, I dropped the pan because my oven mitt was too thin to protect my fingers from the heat. 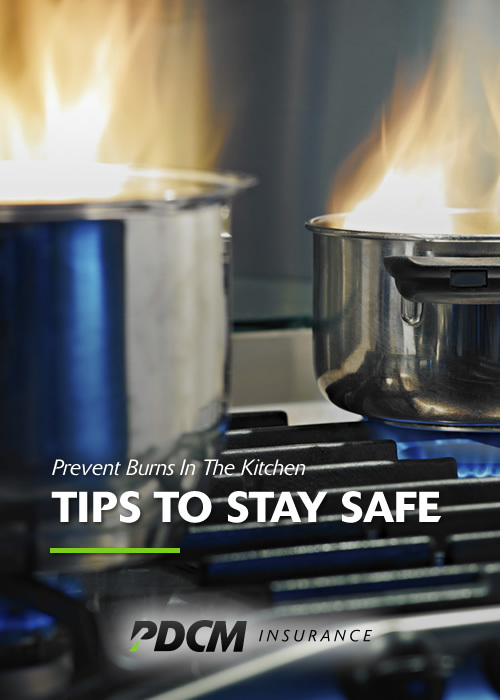 Kitchen burns are extremely common. And maybe you’ve even had an experience similar to mine. Take the following precautions to save your fingers – and your food. Use the proper hand coverings when removing pans, pots and bowls from the oven, microwave or stovetop. Trade your old-school square potholders for heat-safe gloves or mittens that allow you to get a better grip on cookware and also protect the back of your hands. If you need to replace your potholders, check out these bestsellers on Amazon. When using a gas stove, the flame should only cover the bottom of the pan so it doesn’t shoot out from the sides and burn you. Always open lids away from the body so the escaping steam doesn’t burn you. And for the same reason, use caution when draining hot pasta or pouring hot liquids from a pot into a bowl. Never put hot liquids into a blender to combine them. Hot liquids can fly out of the blender jar, even with the lid on, and cause burns and a big kitchen mess. Instead, use an immersion blender that can be put into a stovetop stockpot for easy and safer blending. Keep a handle on handles. Keep pot handles turned away from you. Outward-pointing handles can be bumped into, shooting hot food in your direction. Wear long sleeves to protect your arms from burns. Make sure, however, that your sleeves are not too loose. Extra fabric can catch fire around burners and open flames. March 24, 2016 in Insurance News.